Politicians have condemned “vile” and “violent” language used against Theresa May over her Brexit negotiations. The PM was also told to “bring her own noose” to a meeting later this week. 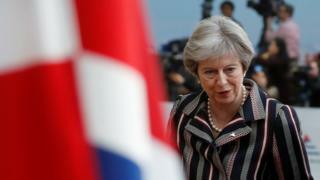 Mrs May is expected to tell Parliament on Monday that the withdrawal deal with the EU is 95% complete and that “important progress has been made” – but the Irish border remains a sticking point in negotiations. “This is vile and dehumanising language towards a woman MP, towards a prime minister who, no matter how much you might disagree with her, is someone who is doing a job in public life,” she said. And some Conservative MPs echoed the criticism. Nicky Morgan tweeted that it is “not healthy politics” to use such language, while Scottish Conservative Paul Masterton said the “snivelling cowards” who made the comments should be reported to the police. Sarah Wollaston also called them “spineless cowards” and raised the death of Mrs Cox. Shame on the spineless cowards on my benches who hide behind anonymity to use such disturbing & violent language about their own colleague & PM @theresa_may Totally unacceptable. Have they learned nothing following the assassination of Jo Cox? Asked on BBC Radio 4’s Today programme about the language, Brexit-backing Conservative MP Mark Francois said it was “unacceptable”, but that he would not tell Chief Whip Julian Smith how to do his job. Instead, he criticised a “bunker mentality” in Downing Street, adding: “The problem is that there is a lot of frustration on the backbenches at the moment, both among Leavers and Remainers, at the general state of play. This led to a fresh wave of criticism from his colleagues, including Remain-backing Tories Heidi Allen and Anna Soubry. Fellow Brexiteer Tory Andrew Bridgen said the language was “unhelpful” and warned his Leave-supporting colleagues that it risked increasing support for Mrs May. He told ITV’s Good Morning Britain: “At the moment that [language] is unhelpful. It won’t persuade colleagues to back a change of leadership.